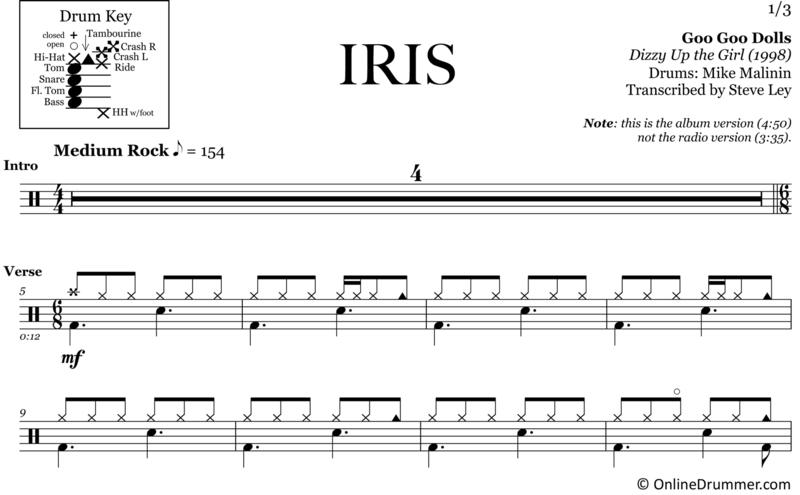 The full drum sheet music for “Iris” by Goo Goo Dolls from the album Dizzy Up The Girl (1998). Iris spent an astounding 18 weeks at number one on the Billboard Adult Top 40, while also peaking at number one across various other Billboard genres: Hot 100 Airplay, Mainstream Top 40, and Modern Rock Tracks — also landing the number one spot in Australia, Canada and Italy. This song uses seamless transitions from 4/4 time to 6/8 time. The acoustic guitar plays a 4/4 intro, and the drums kick-in on the verse in 6/8 time. The bridge rips back into 4/4, and the energy explodes. Mike Malinin plays a drum part that’s both fitting and impressive at the same time. Nailing perfectly-placed power-fills around the toms, loose hi-hat articulations and incredible dynamics, Malinin’s track became a ’90s drumming staple. NOTE: To avoid version confusion, this sheet music represents the album version of the song (4min, 50sec), not the radio edit version (3min, 35sec).